No… none of the above. We just choose not to use it! “Are you CRAZY?” That is most people’s responses, but no, we aren’t (at least we don’t think we are, but I’m sure there are others who would say that is up for discussion). In Northern Virginia no air conditioning isn’t the norm for sure! But then again we don’t often try to follow the norm! We do it for a few reasons… mainly to save money… however… we have a very old unit and it isn’t very efficient and definitely isn’t an energy or eco friendly unit. We can’t afford to just replace it, but we don’t really feel like we need to if we just don’t use it! This has been our routine for at least the last 5 years and now it doesn’t seem odd to us at all. We have actually found there are many more benefits! One of them being that we do more! If it’s hot inside and it’s hot outside, then why stay in? Let’s go out and play, find something to do and take lots of water! We have a neighborhood pool that we use LOTS. 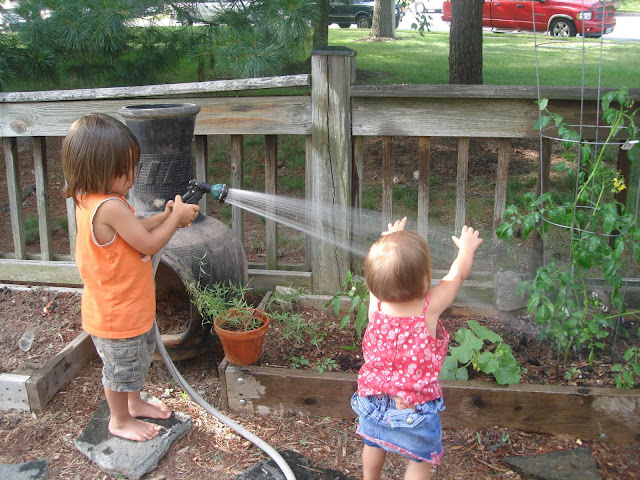 During the dog days of summer when our grass looks like it might die I will run the sprinkler for about an hour in the afternoon and also let the kids play/run/jump in the water. Two things accomplished at once!!! Actually more than that! A drink for the grass, playtime for kids, break time for mama, cool down for kidos and gardens get watered too. An example of getting out and doing more… We told friends we were heading to the pool and asked if they wanted to join us… her response… “It’s too hot for the pool today.” WHAT? Too hot? How? Get in the water, take a break under the umbrella for some watermelon and kombucha… how is that too hot? Sounds like a GREAT day to me! I know the few days each year we do turn it on we tend to stay inside with the doors shut. We don’t get much sun, don’t enjoy the weather, don’t do anything… in fact i think we may have even watched a movie… in summer when there is SO much to do outside!!!! Our goal is to not turn the AC on unless it is over 100 degrees. So far this summer we have had about 13 days over 100 if I calculated correctly. The forecasted average is only about 89 degrees, but we usually do have some heat spikes, especially in July and August. So far this year we have had the AC running for 3 full days. And about 6 additional hours on top of that. Some days when it’s hot, and hard to fall asleep at night we turn on the AC for about an hour to cool the house down a few degrees and then turn it off. That is usually enough to pull out some of the humidity and let us all fall asleep! I’ve done a little bit of research to try and figure out how much I’m saving… but alas it was much harder than I thought. The label on the AC unit is faded and I can’t read the numbers to know what size it is and how much energy it uses to calculate the cost. It was purchased by the previous homeowners, so I have no paperwork on it either. I also looked up the manufacture, but they no longer carry that model and there wasn’t any information on old models. I did find a few calculators that would help to figure the cost, but without the needed information it wasn’t very helpful. In my searching I did come across the Energy Watcher site which had an article from 2009 about the energy consumption of AC units. They estimate that it would cost an extra $200 a month just to run the AC. Their claim is that the average electric usage from month to month is about 750 kWh, but once the AC is turned on it skyrockets to 2,000 kWh per month. Usually when we do turn on the AC we keep it around 78-80, so there isn’t much incentive to turn it on if it’s only going to go down a few degrees. I also think it’s safe to say that we probably don’t use 2000 kWh since we don’t have it turned down too low. However, I know we are saving money and we are happy doing it! As a last tidbit I’ve made a list of some of the things we do to help us keep cool and keep the house cool and help keep the summer enjoyable! Cool showers are actually enjoyable! On cooler evenings we open a few windows and put in fans to bring the cool air in. Then close up the house in the day to keep the cool air in. Use the crockpot and plug it in outside! Ceiling fans – we have installed three since we have moved in and they have been a lifesaver. All three of ours we got for free from Freecycle and I just cleaned them up and repainted them. Wear lots of light dresses and let the boys run around with their shirts off! Find a creek to stomp around in for the morning or afternoon… or both! What do you do to enjoy the summer and still stay cool?